With our Global leading cloud partners Amazon, Microsoft and Google, we bring to you a host of managed ready to go out of the box services so that your business can move to the high performance, flexibility and security of the cloud in no time! Reward yourself by concentrating on your core business while we setup and manage your infrastructure. All in one solutions on the cloud whether it be your application, database, web or storage servers. We got you covered. A Managed service of all your IT assets end to end on a secured Private Cloud. Active Directory, Exchange, SharePoint, SQL, Storage, Web etc. all managed and delivered as a single service. Secure, scalable and high performance enterprise class storage on the cloud with 99.999999999% redundancy and 99.99% uptime. Low latency and high transfer speeds achieved using Content Delivery Networks. Managed Databases on the cloud has never been easier. Get your migration started in under 15mins. Supports Amazon Aurora, Oracle, Microsoft SQL Server, PostgreSQL, MySQL and MariaDB. Your own supercharged e-commerce store on the cloud. Instant setup & ready to use. Highly redundant and scalable cloud systems ensure your site is always up and running to take in customers. Mobile Apps - Build, Test & Deploy, Mobile Analytics, Mobile Content Delivery, Mobile User Management. All in one solution on the cloud for your Mobile ecosystem. Backed by a fully managed big data cluster from Amazon EMR powered by Hadoop with MapR distribution on the cloud, we get your cluster ready in under 10mins! Use our robust cloud Hosting network to power your websites starting as low as Rs.49/Month. Comes with a domain name, email and sitebuilder to establish your unique identity on the internet. Ensure an accelerated and latency free experience for your end users by leveraging content delivery networks to distribute your content globally with ease. Why Ecomm India Cloud IT? All our services come with top tier ITSM framework based support available to you anytime, anywhere through phone, email & ticketing. Every service is fully managed by a team of cloud specialist. This ensures you can concentrate on your core business roles while we manage your IT. Our highly optimized cloud migration programs ensure your cost savings are maximized backed by an OPEX and pay as you go model. Our services come with custom built dashboards that are tailored to your cloud environment to give you deep insight into operational performance. 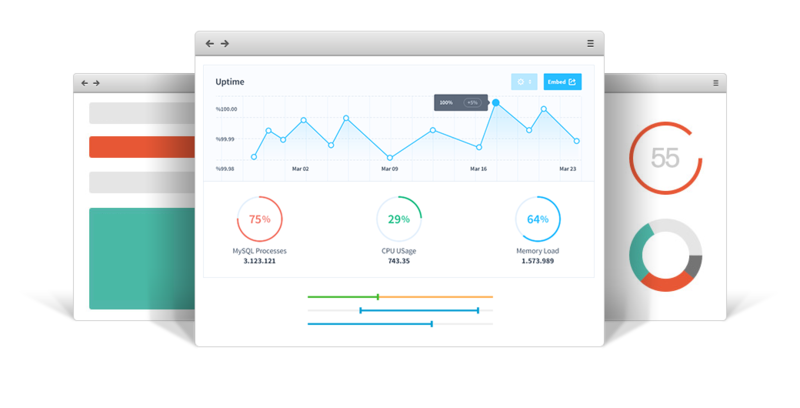 All our cloud services come with custom built real time monitoring dashboards that give you deep insight into the performance of your cloud environment. Ecomm India Cloud IT LLP, all rights reserved.